Greater Philadelphia Bicycle News: Can Philadelphia Get A Cycle Track? Can Philadelphia Get A Cycle Track? With New York's 9th Avenue cycle track (physically separated bike lane) being carefully watched by the NY DOT I cannot help but wonder if there are suitable roads where we can do the same treatment. 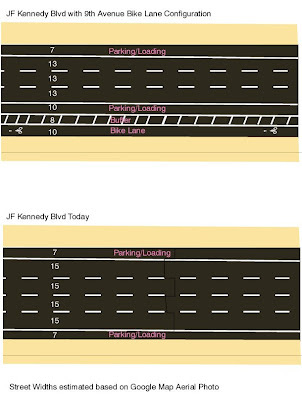 The ideal candidate would be an excessively wide road with lots of bike traffic John F. Kennedy Blvd between City Hall and 20th Street looks like a winner. The road is extemely wide at (>70') with four very wide lanes and parking lanes on both sides. In Unversity City Chestnut St, Walnut St from the Schuylkill to 34th and 38th Street are all worth looking at. Does Philly really want a cycle track? Thats the real question and if you did why would you make the mistake of putting it on the wrong side of the road like NYC does. Buses be damned, bike lane belong on the right side of the road not the left/wrong side! Copenhagen, Denmark released a study earlier this year comparing the accident/injury rates on roads before and after they received cycling improvements. Enhancements were cycle tracks, cycle lanes, blue cycle crossings and raised exits. They found that all these treatments increased accidents and injuries for cyclists more than the number of cyclists increased. But cycle tracks were by far the worst. They increased cycling on these roads by 17-18%. A few types of accidents decreased, such as between bicycles and parked cars ( dooring?) and hit from behind accidents. But these were more than made up for by the increase in intersection accidents - injuries from right hooks increased 161%, left-hooks 61% (these are for both cyclists and low-speed mopeders, but cyclists make up 90% of the numbers). Injuries from collisions with entering/exiting bus passengers went up 1762%! They increased significantly the accidents and injuries for all road users - cyclists, mopeds, pedestrians cars. Also, while bicyclists said they felt safer on the roads with cycle tracks and the number of cyclists there went up (although significantly less than the number of injuries0, it's not clear at all that they increased the total number of cyclists in the city. It's likely that they just changed their route to use these tracks. The safety issues observed in Copenhagen match those observed elsewhere. This is why the federal bicycle standards do not recommend cycle tracks/side paths.